Happy Halloween everyone! Decorating for Halloween has always been a favorite holiday activity of mine. 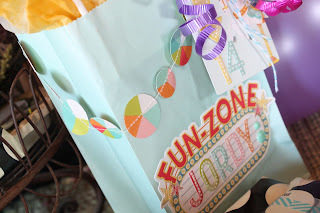 I have to say though that as my girls grow older, I miss the buzz of getting costumes ready, preparing treat sacks for classmates and friends and the excitement that comes with preparing for the big day. My girls are going to friends' houses after school that live in neighboring towns. There's lots more action there than out here in the country. I sent the reds out the door with a heavy coat, money and a treat sack that I made for them. Jordan did carve a pumpkin last night so I was happy to get some shots of that. You're never too old to carve a pumpkin. We do have a few littles left in the family though so I made some treat sacks for them. 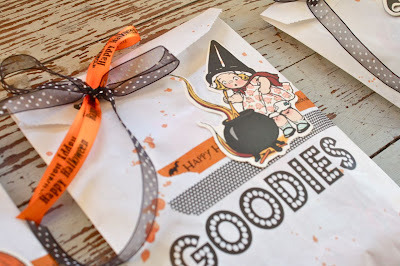 I used some printed sacks that I had in my stash and reached for my October Afternoon Witch Hazel collection. 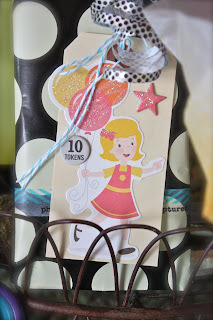 A few splashes of orange Sprinkler spray mist, some Washi tape and a cute little die cut finished off each treat sack. For my two girls, they like the gory side of Halloween. I used red spray mist for their treat sacks to resemble dripping blood. And a few good blood spatters for my forensic science loving Jordan. I stitched some accents onto some journaling cards to make some quick and easy tags. Black polka dot ribbon for all the sacks and that was it. 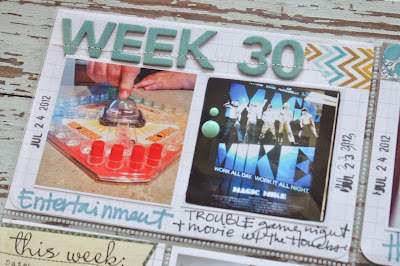 Hey there, back today with Week 31 of my Project Life 2012. 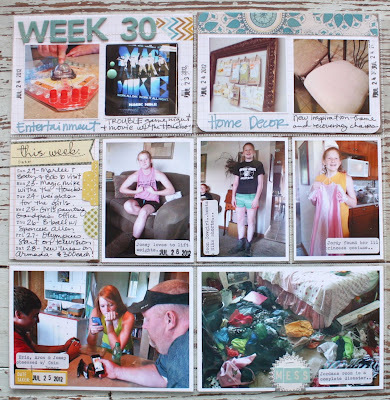 Week 31 is quite appropriate for me to share this week because all of the accents I used are from October Afternoon's Witch Hazel collection. 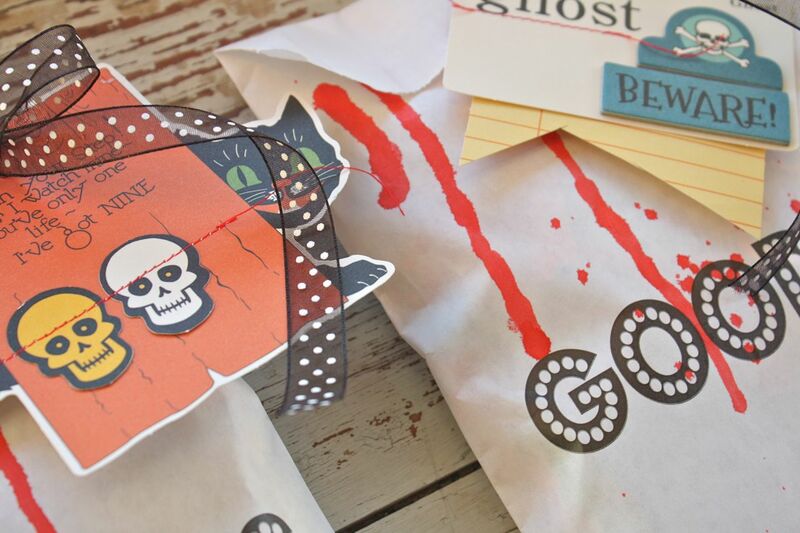 You might be thinking it's time to put away this Halloween line. Or if you haven't purchased any of the collection yet you might be thinking it's too late. Not the case at all. I loved so many of the more all purpose pieces from Witch Hazel. 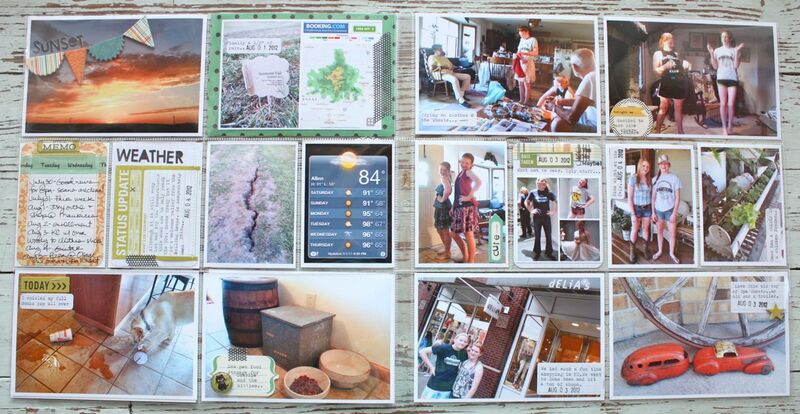 So here's the 2 page spread. Wrapping up the last few weeks of summer here with school shopping and still terribly hot weather. At this point, I was trying to do two things.....keep my album fairly flat as to avoid a 3rd album for 2012 and finishing up the pages rather quickly so I could play catch up. 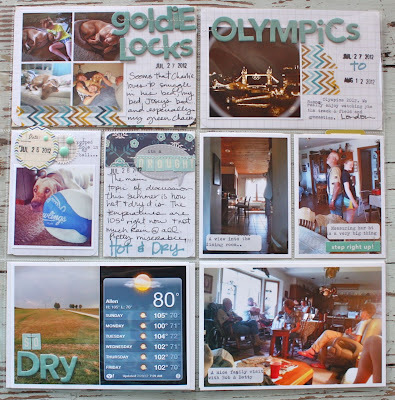 I used lots of full 4 x 6 photos to fill the slots + lots of 3 x 4 photos with minimal journaling. 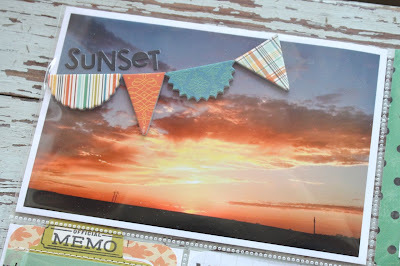 Loved the Witch Hazel chipboard banner and sticker letters for this beautiful sunset photo. 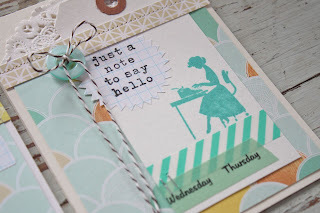 A great green background here using some B sides of Witch Hazel papers. 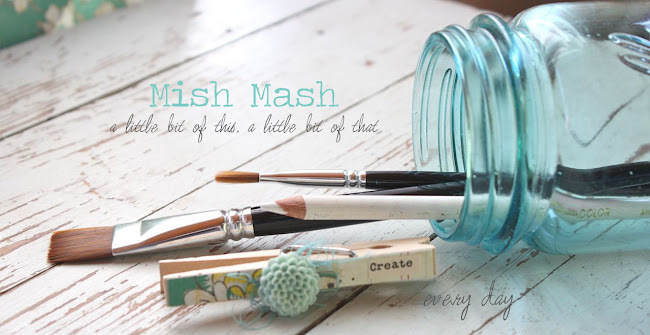 The mesh Washi tape is also very all purpose. A typed label here + a tidbit from Witch Hazel. 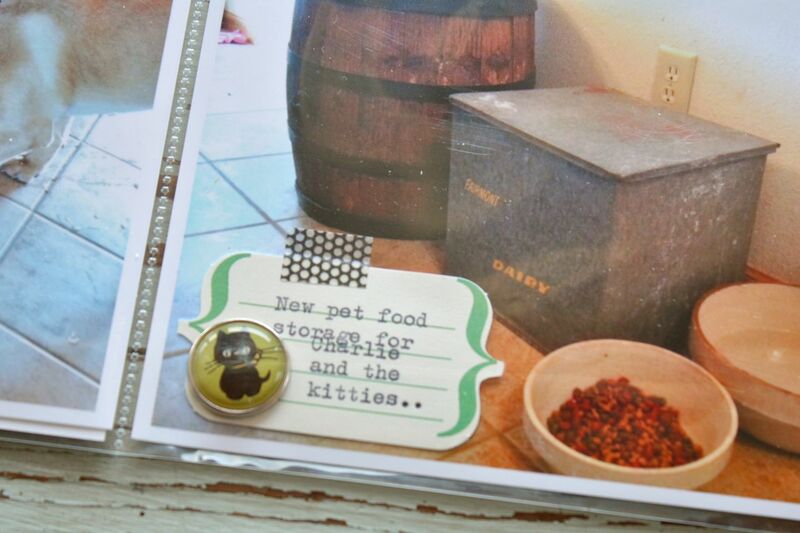 Another label with Washi and a kitten brad that takes on new meaning for this insert. Another label I ran through my typewriter. Just letting the photos speak for themselves this week. A typed grid paper label with a chipboard star from Witch Hazel. 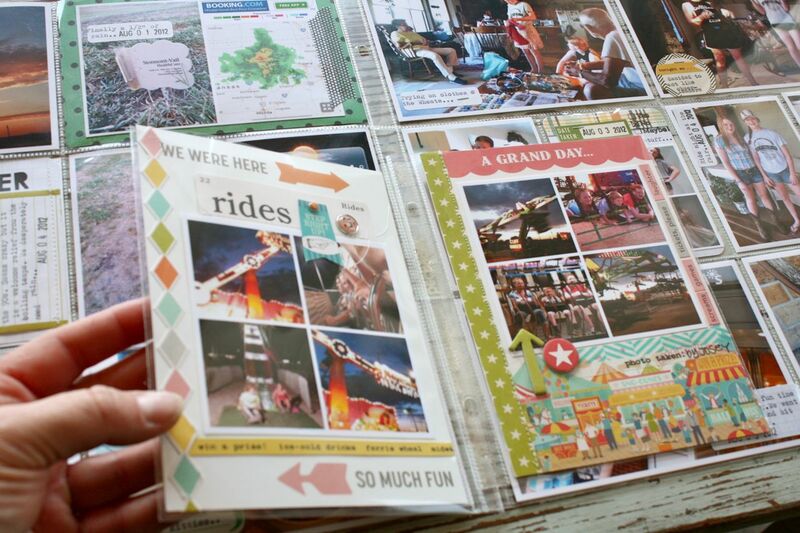 For these 3 x 4 inserts I used Project Life journaling cards, one plain grid + one patterned card. 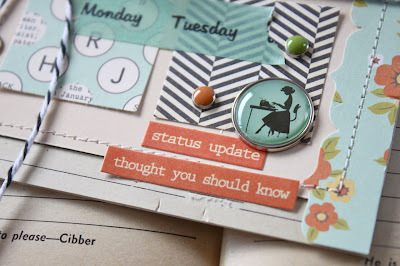 A little plaid Witch Hazel paper dresses up a plain grid PL journaling card + a little label was used for the date stamp. 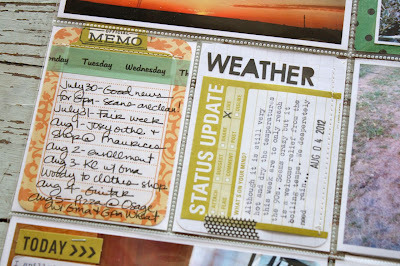 This is the week that holds my insert pages about our fair night. I love how the two lines of October Afternoon Midway and Witch Hazel totally sit side by side so well. A very good week to have in the books. 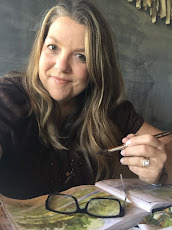 In other news this week, I'm working hard behind the scenes to bring you a fun series of blog posts dedicated to my December Daily and Project Life. I'll kick off the fun with my first post on November 1st. 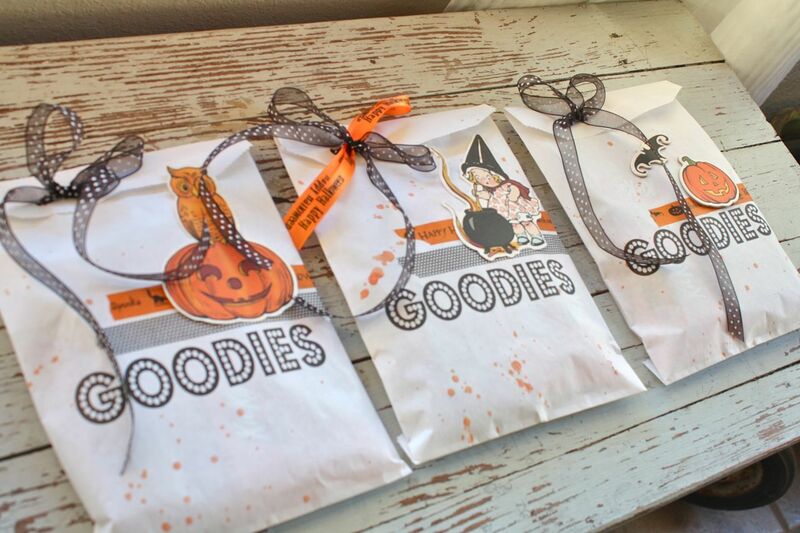 Tomorrow I'll be back with some fun treat sacks I made for the little kiddos in the family for Halloween. I really miss all the costumes and parties now that my girls are growing up. I'm also working on some fun posts where I'll be sharing my new love of crock pot cooking and preparing freezer meals. It's made my life so much less stressful. In shop news, the card kits are now 20% off. They're great for creating quick and easy cards to give away this holiday season. The clear card boxes are going to be my method for giving a bundle of cards away this year. If you're collecting supplies for Project Life and a December Daily, many of my tags and bags will be great for the basics. 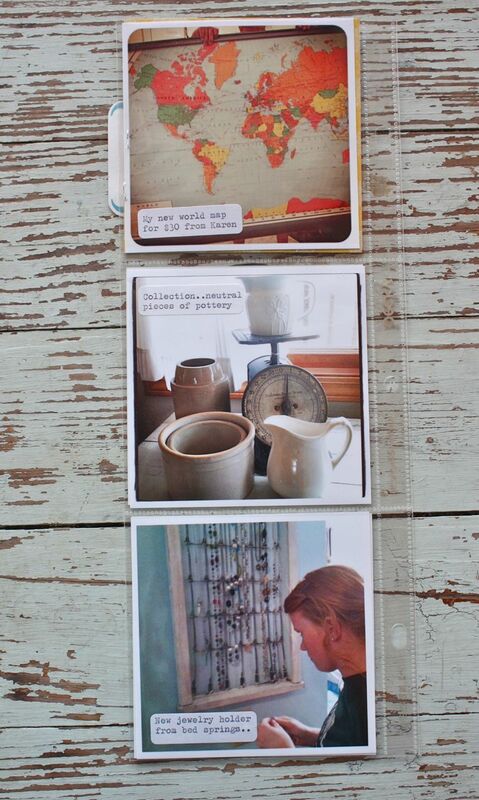 And my grid paper labels and notebook papers labels will make for some easy journaling labels. Thanks for stopping by. Praying for safety for everyone in the path of Hurricane Sandy! 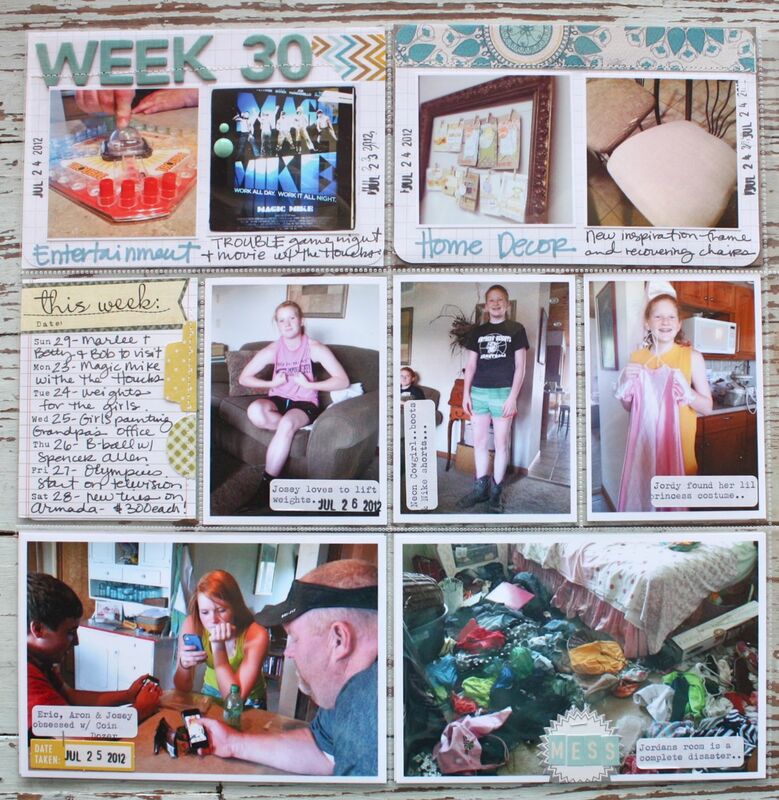 Back to the blog today with Week 30 of my Project Life 2012. We were winding up the last of July. Still very hot with temps in the 105 degree range, lots of swimming in the pool, the Olympics started and we had a small family gathering. 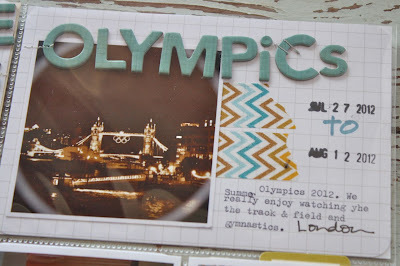 This week I had some new My Mind's Eye papers and Washi tape sitting on my work desk. Seems like a good time to use what's sitting out. 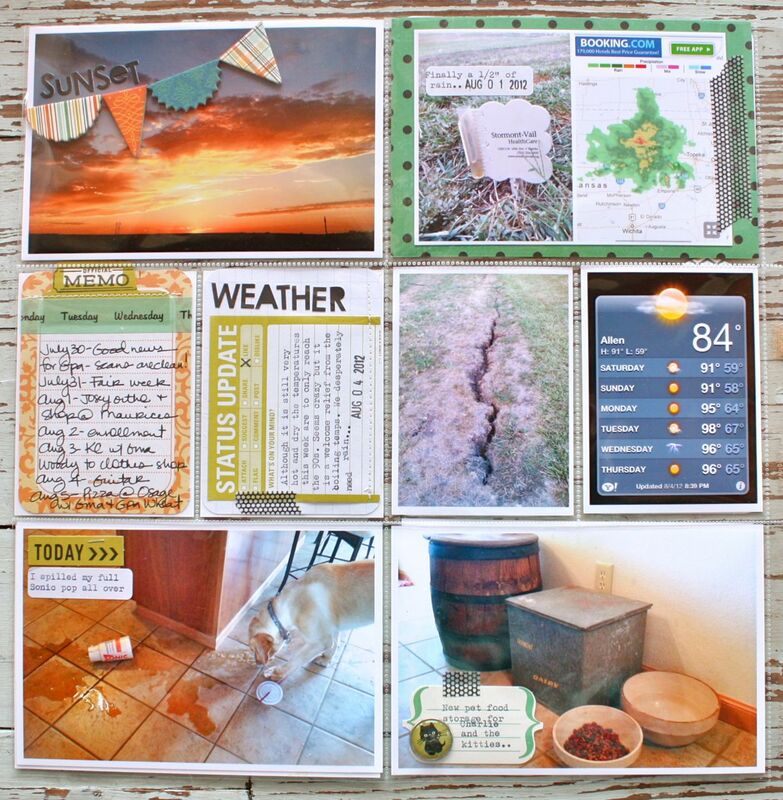 I had pre-made some journaling cards using the plain, grid Project Life cards as a base. 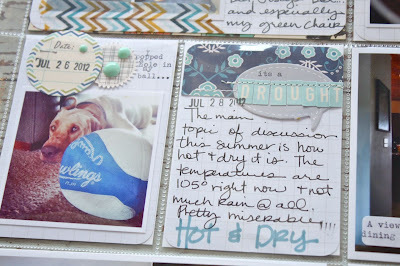 There were lots of blues this month in my photos which dictated the main color scheme for my weekly spread. Every so often I like to add in what week it is in the form of a title. This helps to gauge where I am in my Project Life album but also it gives us a countdown of sorts to how many weeks have passed by this year already. 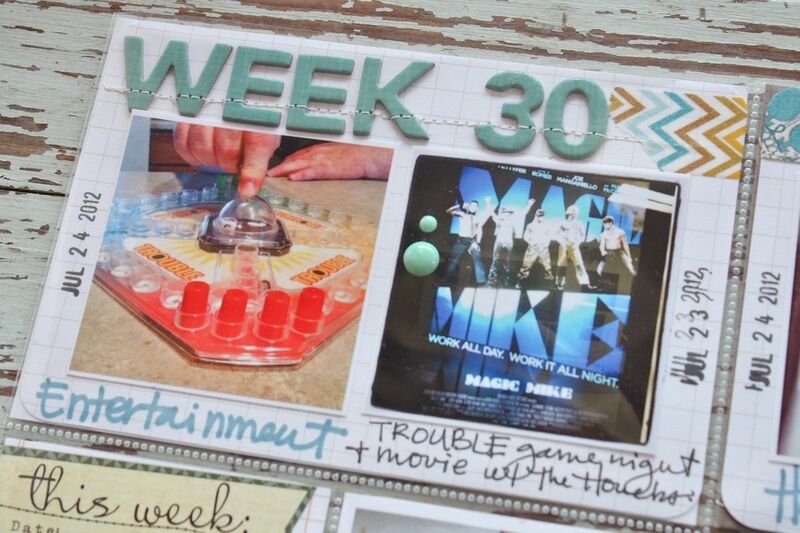 This 4 x 6 spread talks about our entertainment of the week...a game of Trouble and Magic Mike with some friends. 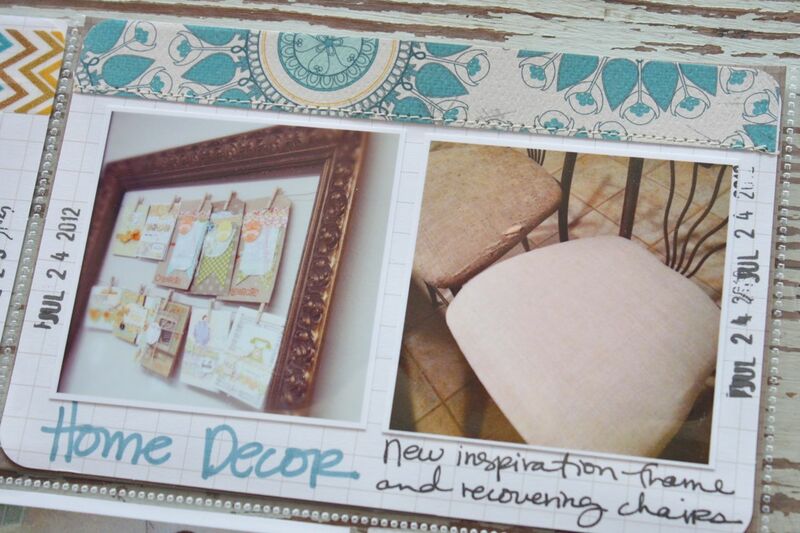 Here I have a few photos of home decor....a new inspiration board for my work room + some recovering of the kitchen stools. 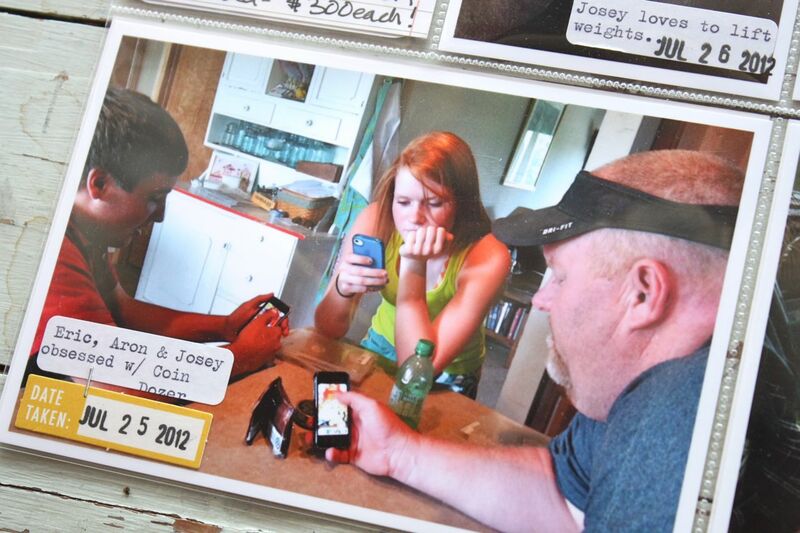 Here I captured a bit of technology in use...Josey, her boyfriend and Eric all playing Coin Dozer. There was just a wee contest going on at this time. This photo is one that as a mother I can only laugh and know that in years to come this will be so funny. It's a constant struggle for the girls to keep their rooms clean. 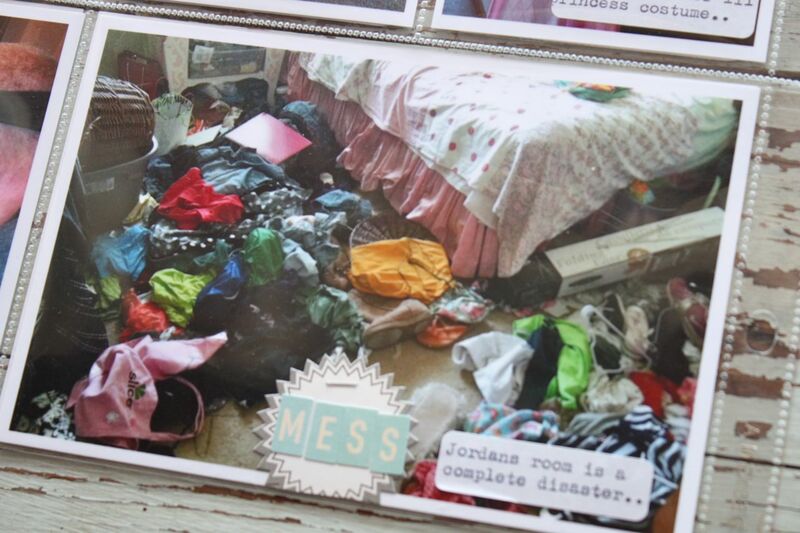 Here, Jordan had taken all her clothes and thrown them on the floor so she could sort them out. In the midst of all this mess, she also decided to move her bed around. I guess as they say, pick your battles. It seems as though little Charlie boy is getting quite spoiled right about now. Although he has a nice snuggly bed, he prefers Josey's bed. And my bed. And the sofa. And my favorite green chair. Any place but the floor. He is a mess of an overgrown puppy. 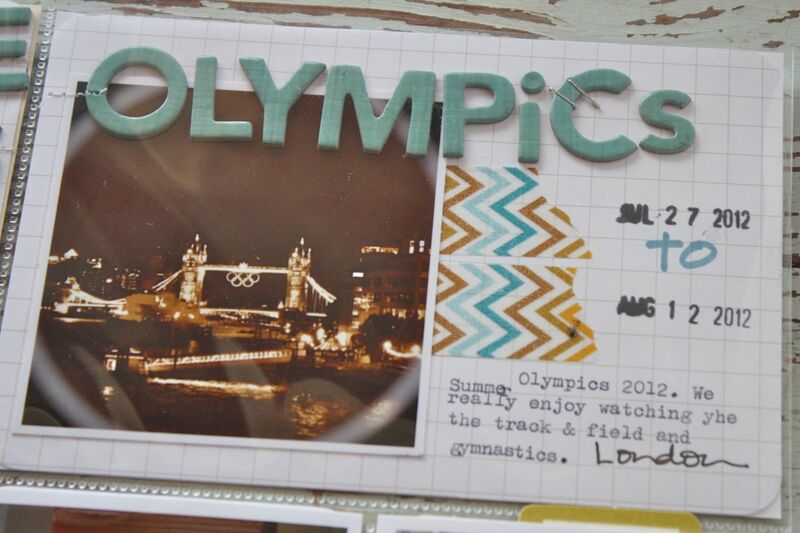 The Olympics started and we settled in each night with our favorite events. 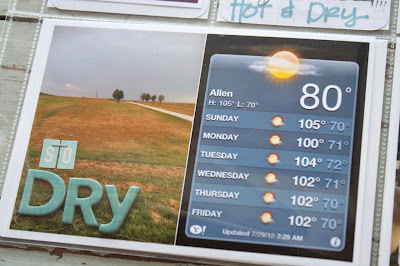 The drought we had this Summer was the hot topic so to speak. Temperatures up to 105, no rain and everything was just dead and dry. 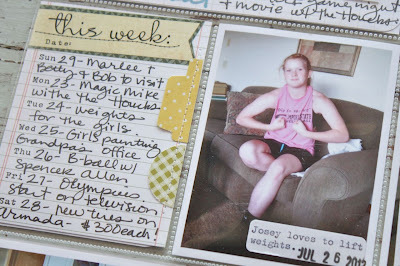 Here I used an Elle's Studio journaling card to give a recap of the week. On the right Josey is showing me her muscles, a weekly occurrence it seems.The girl loves to lift weights. Some 3 x 4 embellished cards, two of my faves from this weekly spread. More talk of the drought and poor Charlie popped his basketball. Seems we can't find any toys that Charlie doesn't destroy, eat or tear up. I also had an insert this week. I used a Design I Photo Pocket Page which is perfect for holding some square Instagrams. I made small collages of my little niece Marlee who came over to swim one day. I used the top pocket to add some patterned paper, some journaling made from a Project Life 3 x 4 grid card and my typewriter and some stitched on chipboard letters. Very simple but I was able to document a fun story without having to worry about creating a full layout or adding a lot of bulky embellishments. 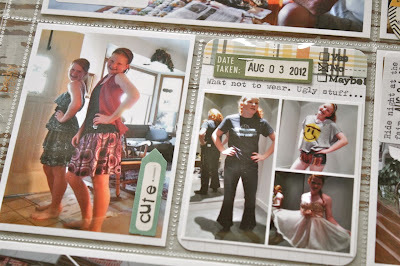 On the back of the insert which measures 4 x 12, with 3 pockets, I added some extra photos from the week. I'm always excited when I actually complete the inserts for the week also because I know there are more stories told for the week. So how is your Project Life coming along? 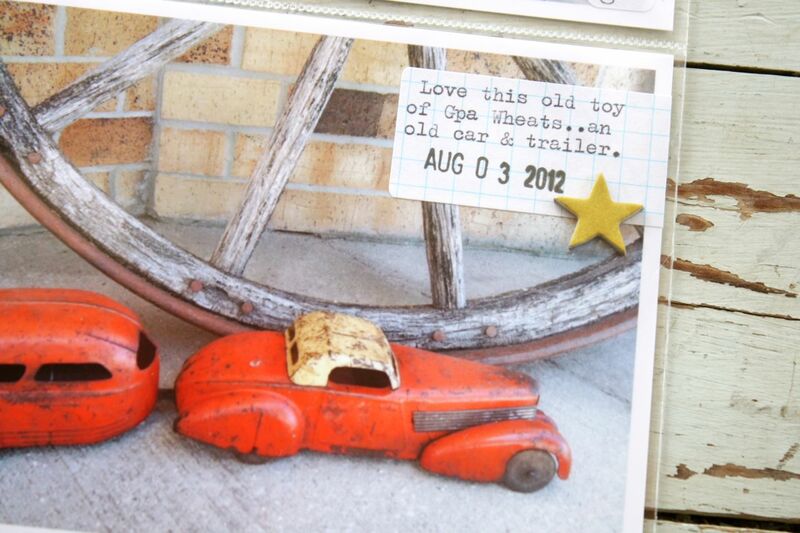 I'm trucking along.....taking photos, making notes in my calendar and enjoying the creative process. 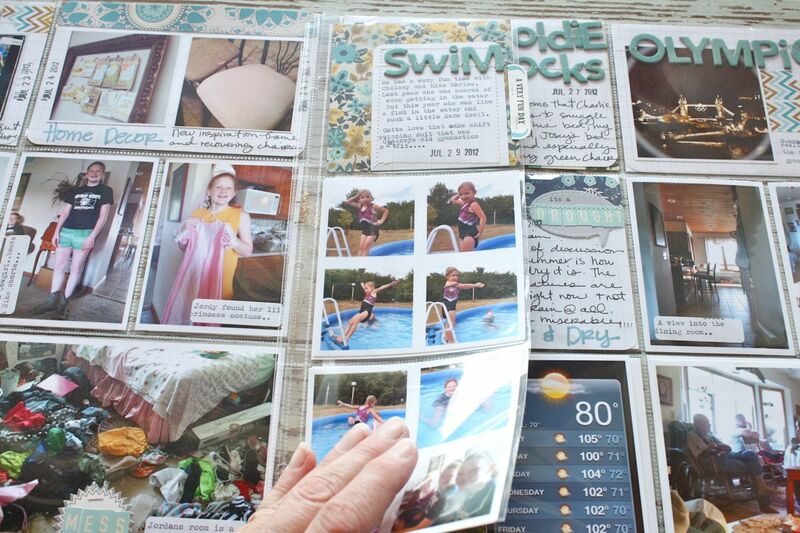 So thankful to have this method of scrapbooking. Hey everyone, today I'm joining in with Lexi over at the October Afternoon blog. She has a new sketch up and asked me to participate in creating a new project using it. I chose to create a card based off of the sketch. 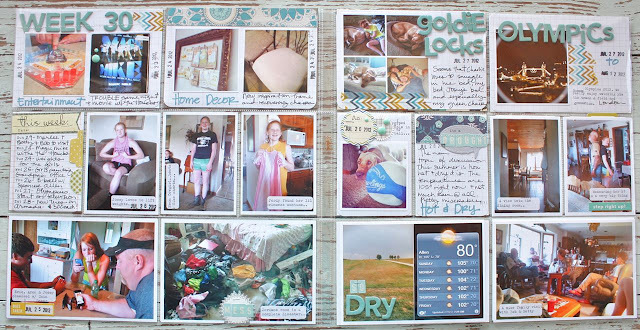 I love how sketches can be interpreted for any type of project you want to create, whether it be a scrapbook layout, a card, a notebook, etc. 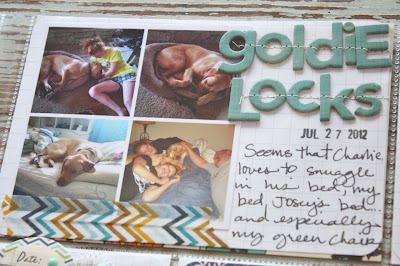 For my card, I used products from the October 9 to 5 collection. 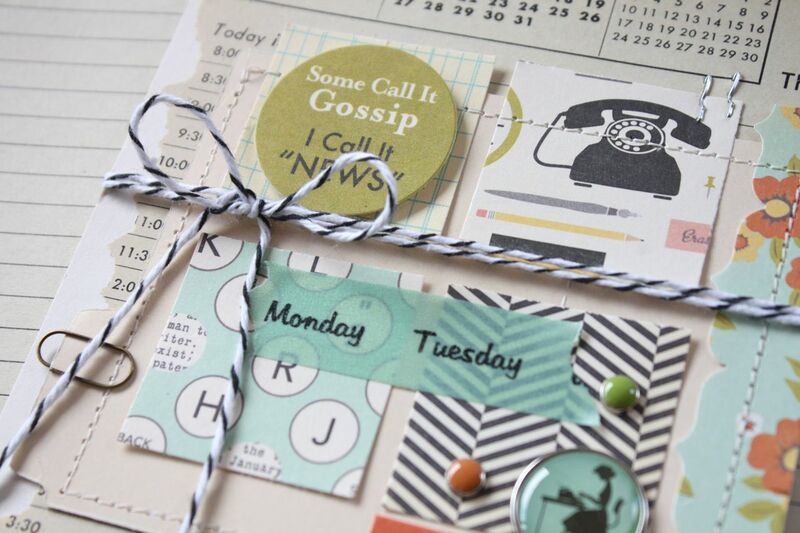 I love anything with an old time-y office product feel and the 9 to 5 collection is just perfect and fun! I loved the 4 square grid element on Lexi's sketch. 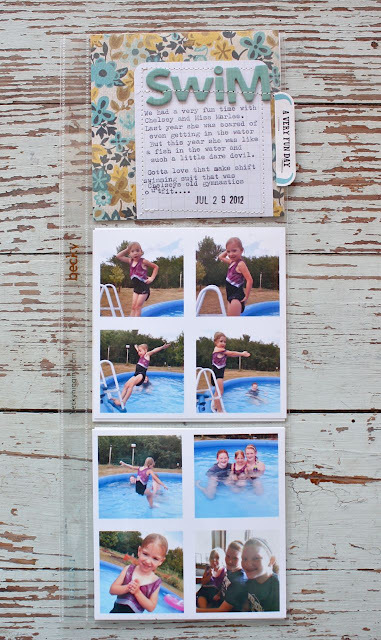 It's the perfect place to use 4 different patterned papers, stickers, labels, tags or whatever little tidbits you have from a collection. A grid design allows you get mixy matchy with product but yet they're all grouped together in a nice, uniform layout. For my squares I used papers from the 8 x8 Paper Pad, a sticker from the Word Stickers sheet, + the Day Washi Tape. I tied it all up with a long length of black and white baker's twine. 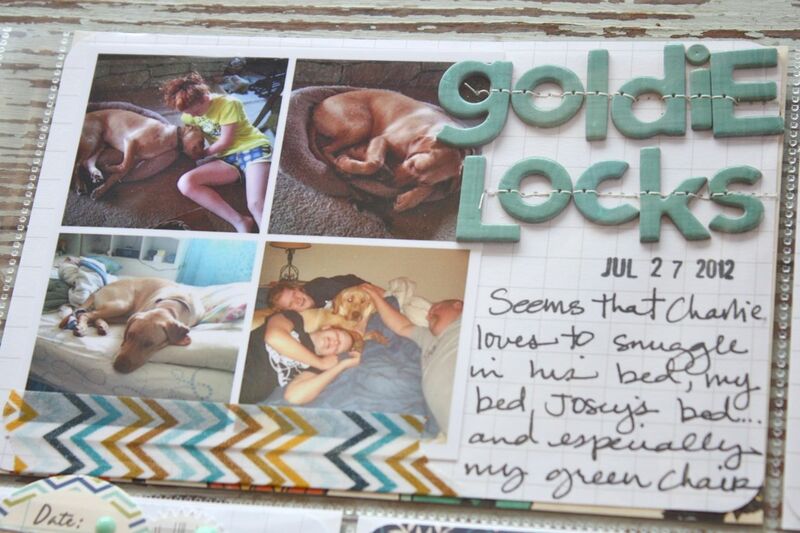 The little grouping of elements in Lexi's sketch allowed for the perfect little placement of more, tiny accents. I used pieces from the Word Stickers sheet, + Designer Brads. The strip of floral paper sewn along the right side of my card also follows Lexi's sketch. 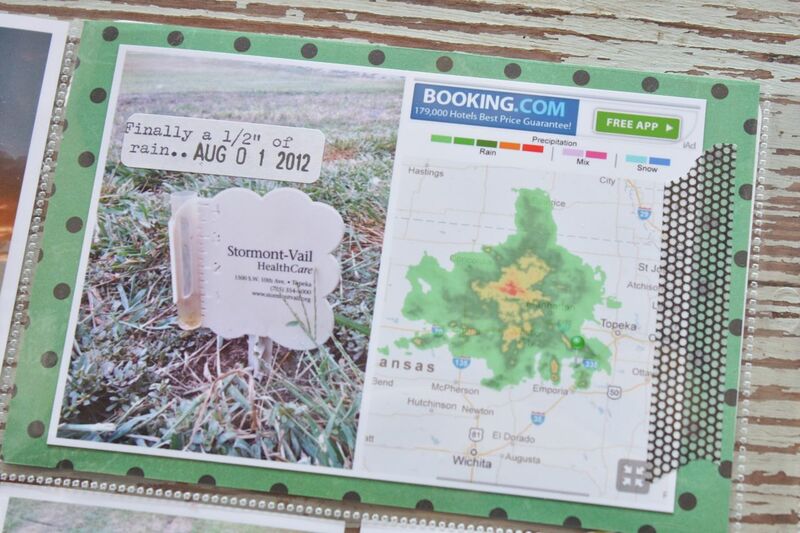 I used a bracket punch to follow my office theme for the card. The background of my card uses a page from a 1946 book called "The Silent Secretary", a cute little date book that I've been hoarding for some time. Hope you enjoyed my take on the sketch. 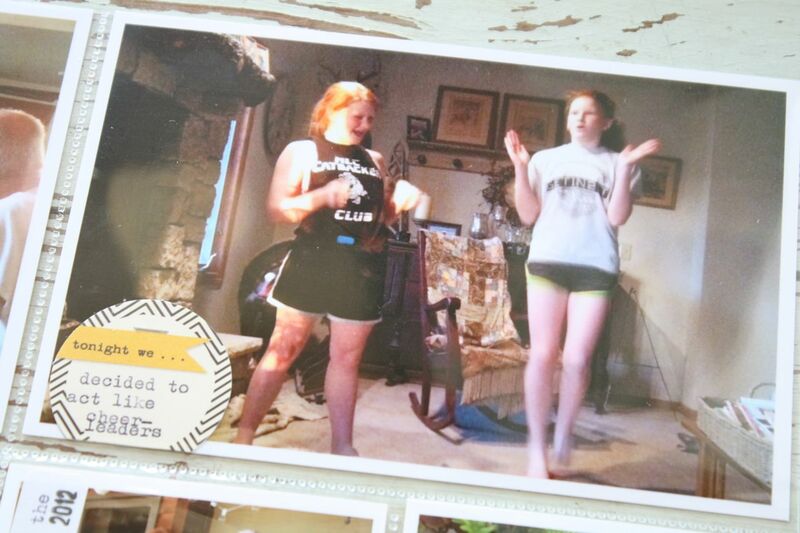 Thanks for the challenge, Lexi! 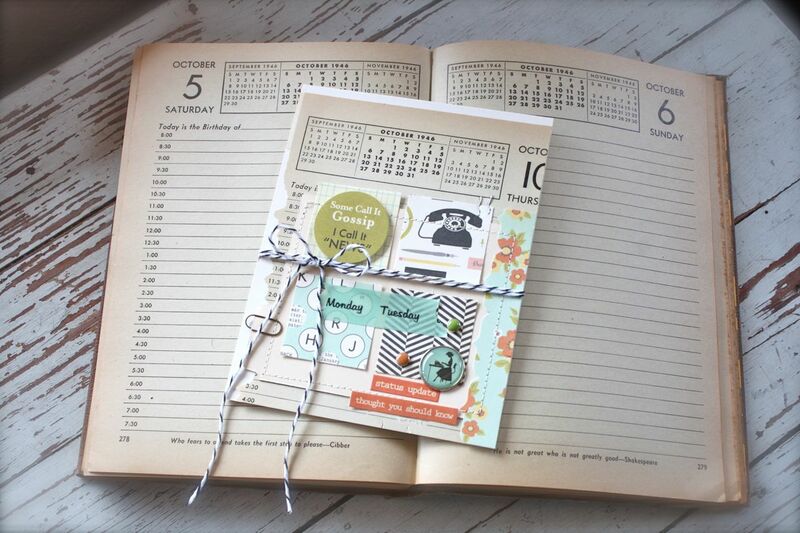 You can find the October Afternoon 9 to 5 collection at 2Peas here. 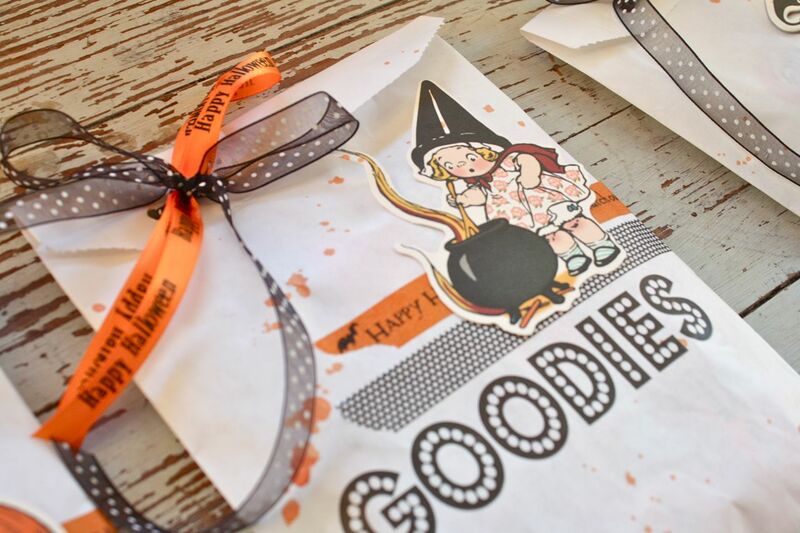 Also the October Afternoon Witch Hazel Halloween line is 25% off right now, a perfect time to add items to your Halloween stash of goodies. In my shop news, I've got my card kits on sale for 20% off + Halloween/Fall items are on sale too. Recently I hosted a challenge over at the October Afternoon blog and Mou joined along with me. My challenge was to use the Midway collection of products to create gift wrapping of any kind. I used this whimsical collection to recently wrap Jordan's birthday presents. 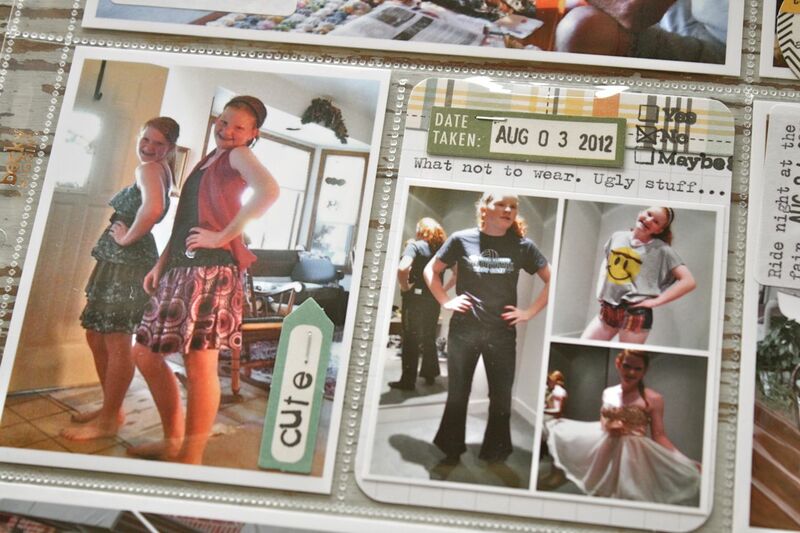 You can find more details on the October Afternoon blog along with photos of Mou's cute project. 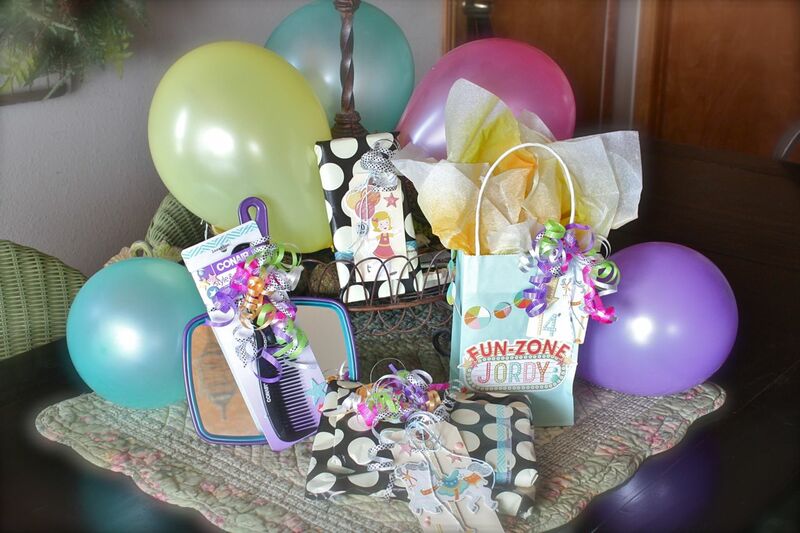 Here's the entire birthday ensemble, so colorful and fun! 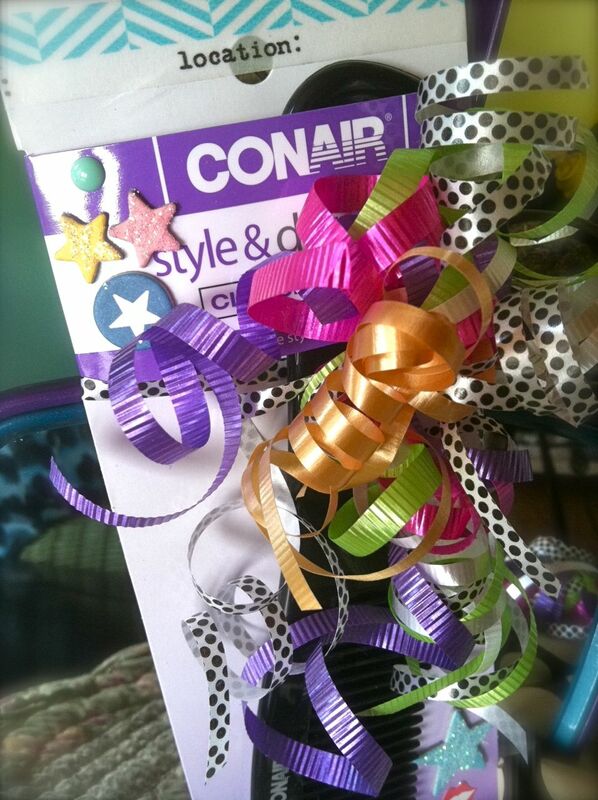 Lots of curly ribbon since Jordy loves it so much. She's my go to gift wrapper of the household so when it came time to wrap her presents, I wanted them to be extra special. 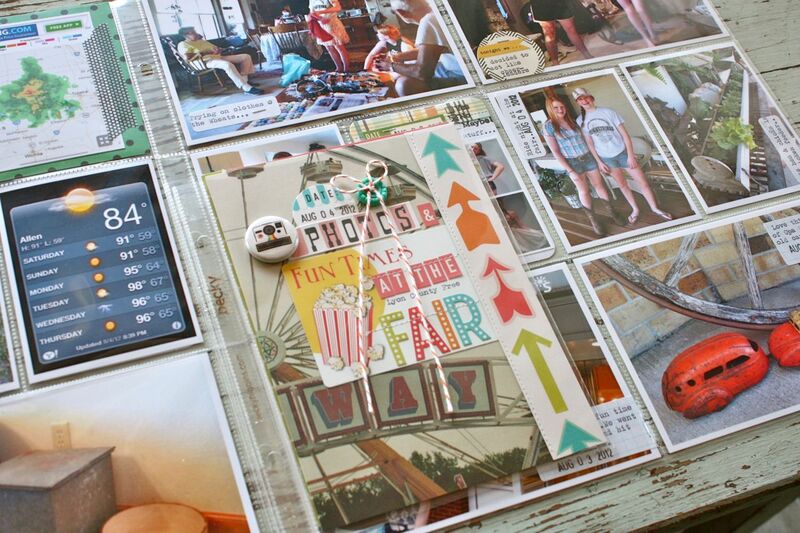 XL Manila Tags were perfect for all the large chipboard elements from the Midway Collection. Stickers were fancied up with glitter and a glue pen. 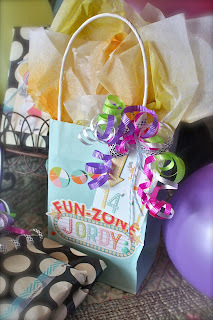 My favorite is this simply gift sack that was embellished with a tag, large stickers and the stitched garland. 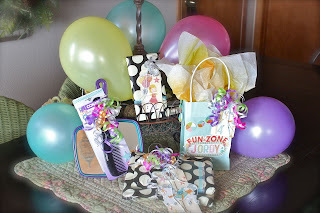 I even used the Sprinklers spray mist to color some tissue paper. 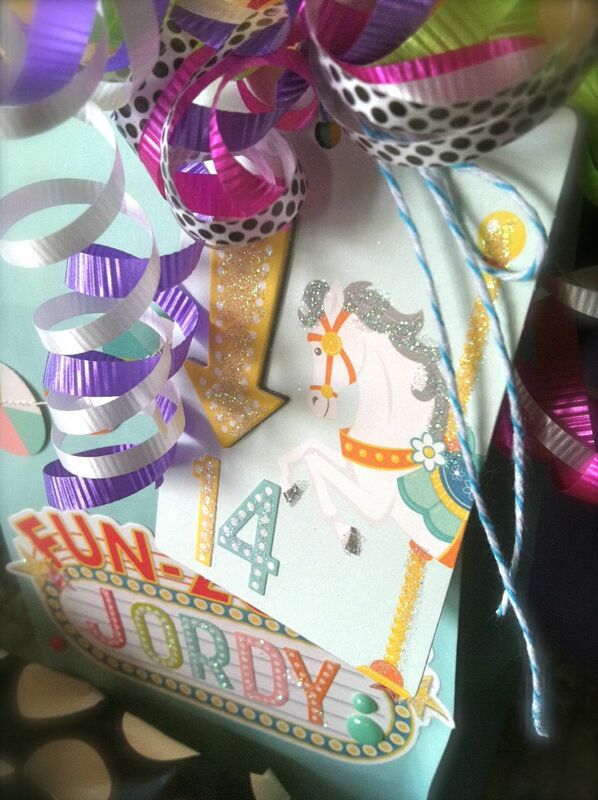 Lots of colorful curly ribbon and more glitter. 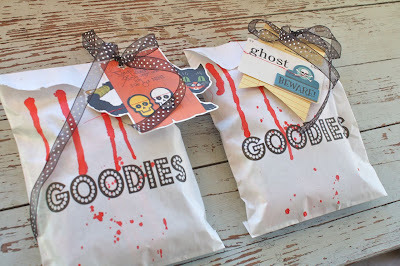 The stitched garlands are so awesome, perfect to drape around a sack. Hope you enjoy and are also inspired to fancy up your gifts using your crafty stash. 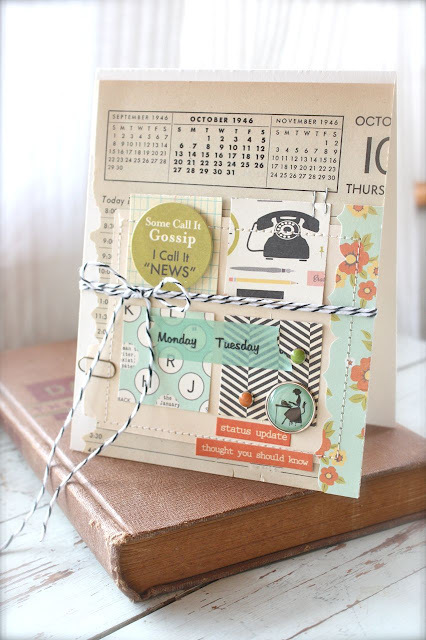 You can find the October Afternoon Midway collection at 2Peas right here. 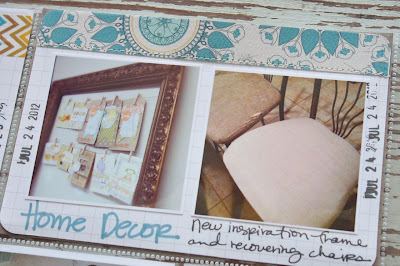 I'll be back tomorrow as I join in a sketch challenge over at the October Afternoon blog. It's getting to be that time of year when I start making my Christmas gift lists. Our moms always look forward to their pretty sack of cards so this week I'm stocking up my stash of cards. It's so cute to see both my mom and Eric's mom and his grandma tear open the sacks first thing and go through each and every card. 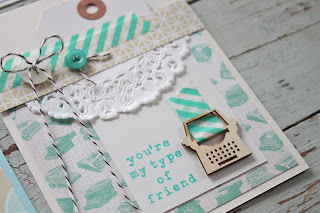 It's what makes stamping and card making so much fun. So since I had all my supplies out from assembling the Happy Day Card Kits, I just kept on creating. Many of you have commented on the happy colors of this kit and mother agrees. She saw this stack sitting on my counter today waiting to be photographed and said...."ohhhh, what cute cards, I love the colors." Little does she know that many of these will make it into her gift this Christmas. So here's stash #1. 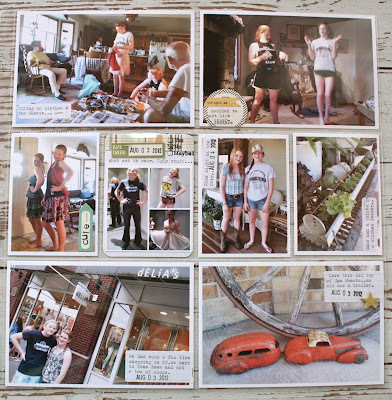 In addition to the kit items, I used lots of items that are still available in the shop. 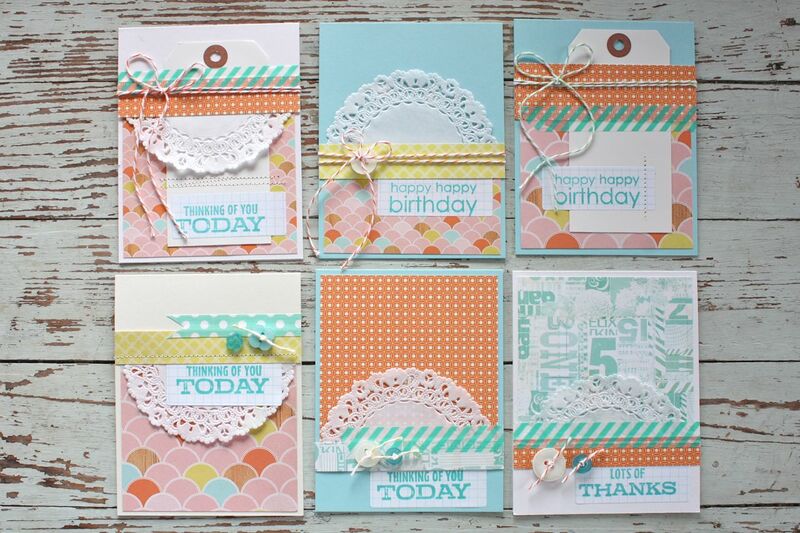 A nice stack of Dainty Doilies came in very handy to add a little texture to my cards. The little strips of Studio Calico fabric strips come in the Happy Day Card Kit. Grid Paper Labels with stamped sentiments also made my card making go really quickly. The grid lines help to line up stamps nice and straight too. A little machine stitching adds fun detail without adding any bulk to my cards. 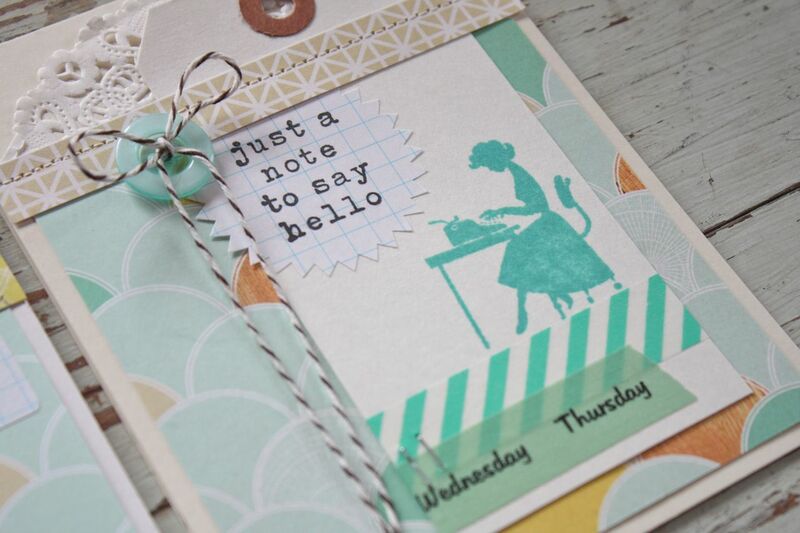 This Aqua Stripe Washi Tape is fantastic for quick and easy cards. Just rip & stick. I love that you can see through the stripes on this one. Here's stash #2 of my cards that I'll be using for gifts. 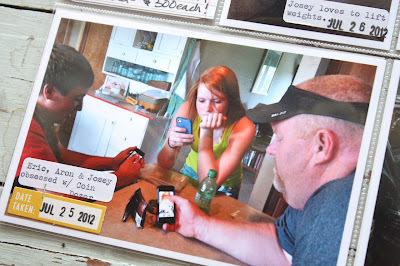 A funny little thing....the moms seem to love the simple cards more than any fancy, heavily layered cards. I think they like the simplicity and clean lines. 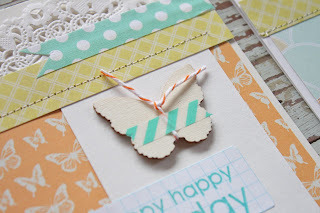 Here I used a wood veneer butterfly from Studio Calico. I tied twine from this colorful bundle around the butterfly then added a cut strip of the washi tape. All of the patterned papers I used for my cards today are from the 6 x 6 paper pad that comes with the Happy Day Card Kit. It's nice to challenge yourself to use just one little pad of paper. 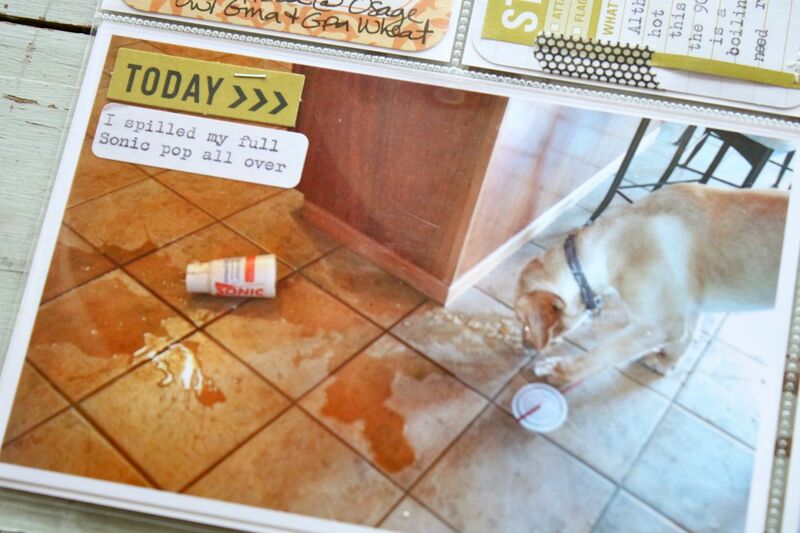 Limiting your choices when you want to mass produce cards is a great tip. 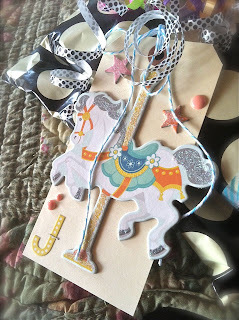 Here I made some notched little pennants from a scrap of patterned paper and the fabric strip. 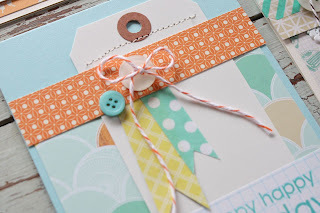 Buttons from the Pastel Button Assortment are just the right finishing touch. I like to mix one white button with one colored button. 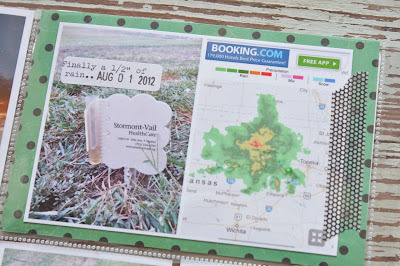 Here I stamped my Hero Arts sentiment on a Starburst Grid Paper Label. I absolutely can't get enough of my printed labels. They are so easy to stamp or run through my vintage typewriter. I know I'll be using them lots in my Daily December. 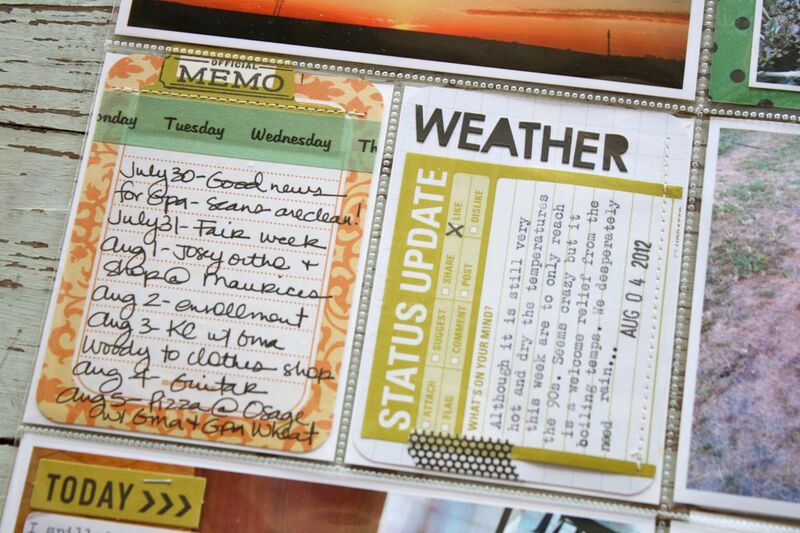 I used more of the aqua stripe washi along with some October Afternoon washi from the 9 to 5 collection. The cute girl typing is also from an OA 9 to 5 stamp set. The Large White Parcel Tags made their way onto many of my cards this time. They're just the perfect size to fill up some space on a card. 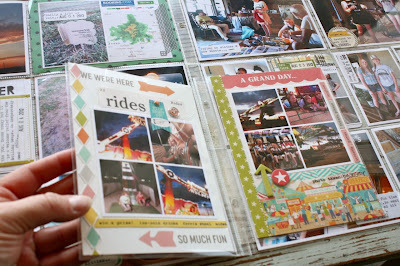 I like to layer them under a horizontal strip of patterned paper & a strip of Washi tape. 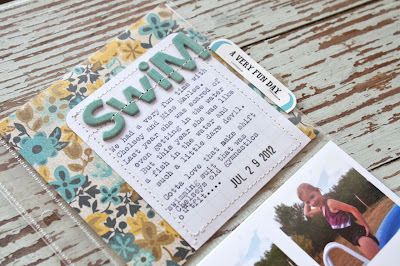 Here I typed my sentiment and then added a wood veneer typewriter from Studio Calico. It was a fun discovery to find that a strip of Washi tape fits right in the typewriter to act as paper. So, I've got a nice little stash built up to add to the holiday card pile. So happy about that. 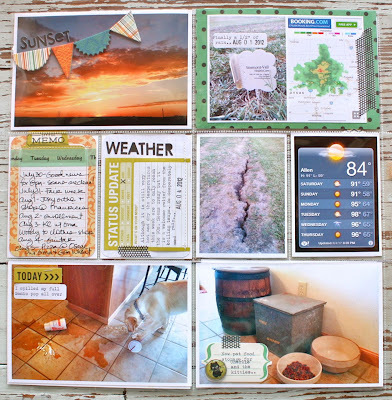 If you purchase(d) a kit and want to keep on stamping past the supplies that I included for the 4 cards, keep that paper pad out and just keep going. 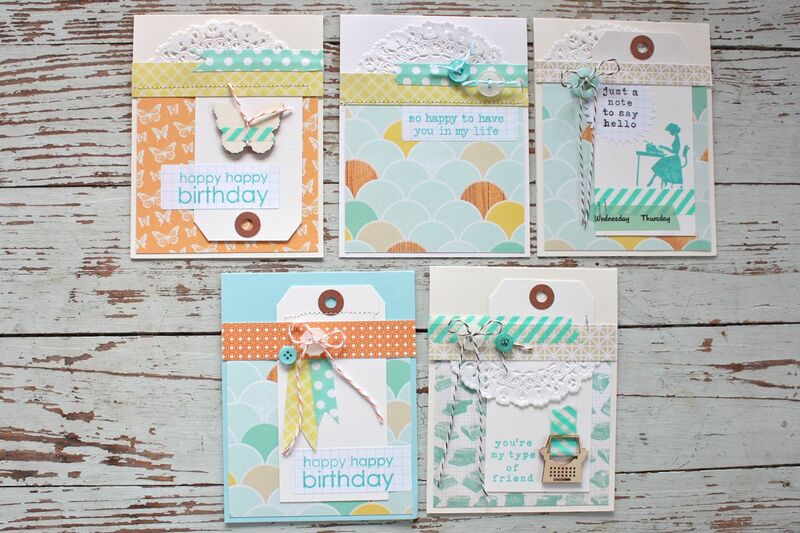 I've got additional aqua envelopes and cream envelopes in the shop that coordinate with the colors in the kit. The Mixed Greetings Card Kit is still available too, perfect for adding more cards to the gift pile. 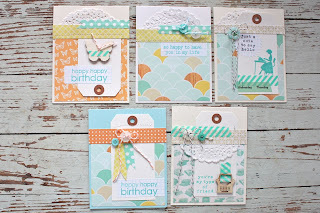 Happy card making everyone!